David Rockefeller, Sr., the last surviving member of the so-called “third generation” of the infamous Rockefeller dynasty, died in his sleep on Monday, aged 101. If we lived in a world where headlines bore any connection to reality, the front pages of newspapers around the world would be informing us that one of history’s richest and most powerful eugenicists, an arch-globalist and committed enemy of humanity, had finally shuffled off this mortal coil. Sadly, we do not live in such a world. Indeed, where does one begin when attempting to enumerate the evils embodied by this man? Chase Manhattan Bank? Chairman and CEO, David Rockefeller. Council on Foreign Relations? Chairman, David Rockefeller. Bilderberg? Founding member and advisor to the steering committee, David Rockefeller. Trilateral Commission? Founder, David Rockefeller. Rockefeller Brothers Fund? Co-founder, David Rockefeller. Eugenicist? When the world’s richest eugenicists meet to plan how to reduce the world’s population, they are called to the table by David Rockefeller and they meet at The President’s House of Rockefeller University (where else)? Recolonization of China? Spearheaded by David Rockefeller. Chairman Mao? His “revolution” was admired by David Rockefeller. North American Union? 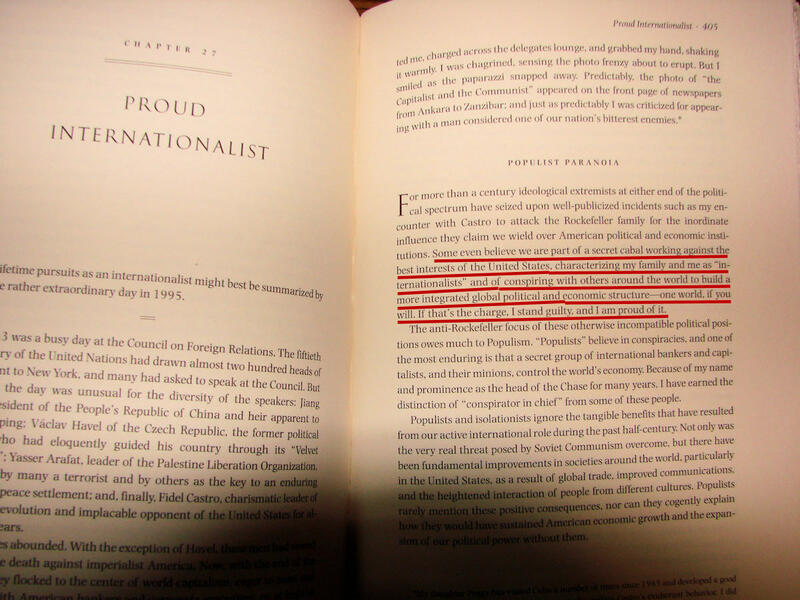 Forget that, David Rockefeller was busy working on a North and South American Union. I could go on. And on and on. And don’t worry, I will in this week’s edition of The Corbett Report podcast. But let’s be clear: There is no joy to be had in the death of another, even a Rockefeller. He left this world as he came into it: filthy rich, gluttonously greedy and mercilessly cruel. He has bequeathed that to the next generation of minions who will swoop in to fill his place in the power vacuum. The world has gained nothing by his death, surely not a respite from the powers-that-shouldn’t-be who will continue on exactly as before. As always, the solace is to be found not in the death of a Rockefeller but in the mass of humanity that is awakening to his machinations. Let us neither mourn nor celebrate this day, but continue on with our quest as those aligned against us will no doubt continue on with theirs.